Today I am going to review Khadi Global Moroccan Argan Hair Shampoo for Healthy Hair and Scalp which is formulated to all hair types. This daily care shampoo Moroccan Argan Hair Shampoo enriched with Rosemary, Tea Tree Geranium & Peppermint Essential Oil. So let's get the details of the product. REPAIR & STRENGTHEN YOUR HAIR NATURALLY: Khadi Global Moroccan Argan Oil Shampoo With 25+ Natural, Botanical Oils and Extracts Add Volume, Texture And Shine to Thinning Hair, Fights Against Drying, Damaged and Dehydrated Hair, Helping to Get Rid of Free Radicals. Our Sulfate-Free Formula is Gentle on Curly and Color Treated Hair. ROBUST COMBINATION OF NATURAL OILS & EXTRACTS: This Ayurvedic Formulation Work Together to Create the Ideal Conditions for Hair Repair, While at the Same Time Fortifying and Strengthening Your Existing Hair and Follicles. BEST LUXURY HAIRCARE WITHOUT SACRIFICING YOUR HEALTH: Contains NO Sulfates, Parabens, Sodium Chloride, Gluten or Phothalates. Researchers have found that shampoos containing sulfates and other harmful ingredients can cause itchy scalp, serious skin irritation and disease, hair loss and damage, and the ability to create nitrate compounds which have been linked to cancer and cell damage. Restore and regain your hair’s strength & shine. Safe for all hair types. Contains NO Sulfates, Parabens, Sodium Chloride, Gluten or Phothalates. Aloe Vera leaf juice, Glycerine, Limonene (Derived From Natural Essential Oil), L Lysine, Linalool(Derived From Natural Essential Oil), Silk Protein, Nutgrass Extract, Lysine, Maze Strach, Soya Protein, White Willow Bark, Meadowfoam Seed Oil, Jojoba Oil, Avocado Oil, Dimethicone, Geranium essential oil, Peppermint Essential Oil, Cold Pressed Argan Oil (USDA Certified), Cold Pressed Extra Virgin Olive Oil, Aqua, Moringa Leaf Extract, Hoarsetail Extract, Bibhitaki (Terminalia bellirica), Manjishita Extract (Indian Madder), Thyme Extract, Ratanjot Extract (Alkanet Root Oil), Nardostachys Jatamansi Extract, Amla Extract (Indian Gooseberry), Nag Keshar (Indian Rose Chestnut) Extract, Reetha (Indian Soapnut)Extract, Decyl Glucoside, Lauryl Sarcosinate, Carbomer, Phenoxyethanol, Propane Glycol. For Best Result, Use Khadi Global Moroccan Argan Oil Conditioner After Every Wash. The product is also safe for daily use and for color treated hair. This shampoo is packed with hair repairing nutrients that renew and rejuvenate dry, damaged and thinning locks. Whether your scalp is dry or oily, your hair is likely still in need of a serious moisture infusion. The ends of your hair are driest and most prone to damage, breakage and split ends. Argan Oil along with the other rare herbs in this shampoo help to repair damage and seal split ends while promoting hair growth. The first thing I liked about this shampoo is, it’s a mild shampoo which contains various natural ingredients for better nourishment of hair. One more thing I love about this shampoo is the texture of the shampoo is pretty thin and very smooth which spreads evenly and easily on the hair. I have very dry and frizzy hair but my scalp is petty oily just after the first use, I have noticed that my hair really looks frizz free and smooth even without the conditioner and the shampoo effectively cleans my scalp too. Also, it makes my rough and dry ends softer and smoother as well. These effects stay for 4 to 5 days which is quite good. I absolutely love this result. Nowadays I feel my hair so light, manageable and smooth. It smells refreshing and nice, which is soothing and not at all overpowering. After shampoo, the smell does not last long on my hair. The best part of this shampoo, it is rich in Vitamin-E, it nourishes hair, repairing split ends and increase hair’s shine and overall healthy appearance and safe for all hair types which 100% SLS FREE 100% PARABEN FREE 92% Natural Shampoo, Contain 0% Harmful Chemicals. 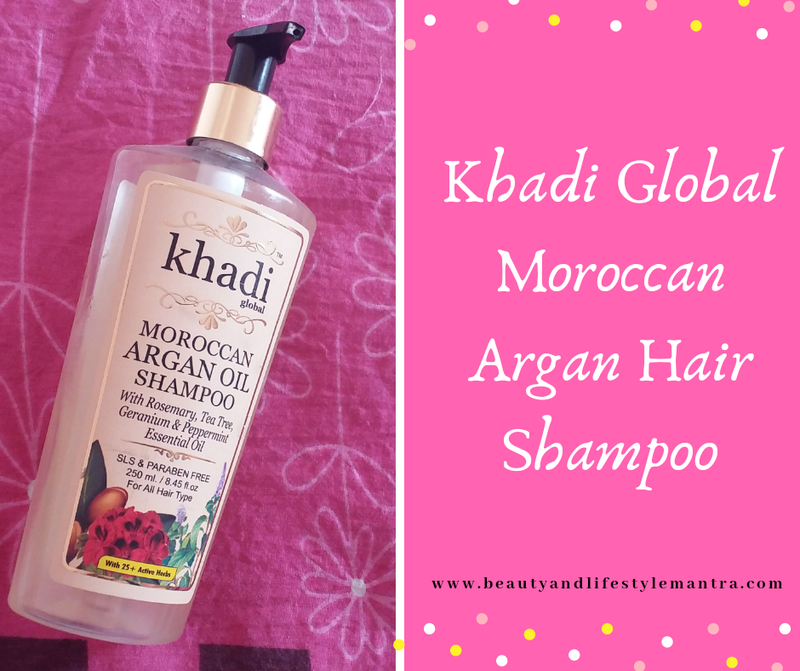 Khadi Global Moroccan Argan Hair Shampoo repair and protect hair naturally and it's ayurvedic formula fights against drying, damaged, and dehydrated hair, helping to get rid of free radicals. I would definitely highly recommend Khadi Global Moroccan Argan Hair Shampoo Rosemary Tea Tree Geranium & Peppermint Essential Oil Infused For Healthy Hair & Scalp to all.